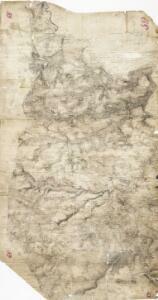 Description: This drawing highlights Bath and the River Avon. Major communication routes are coloured yellow/buff, according to military cartographic convention. Shading and 'hachuring' denote relief and give an overall impression of the undulating landscape. The Somerset Coal Canal is clearly visible leading into Bath. It was established by Act of Parliament in 1794 and welcomed by the mine owners of north Somerset as a cheaper way of transporting coal to Bath and the surrounding areas, curbing fears of an influx of Welsh coal. The canal was one of the most successful in the country, carrying over 100,000 tons of coal per year. That success was to be checked, however, by the expansion of the local rail network, in particular, the opening of the line between Radstock and Frome, which hastened the canal's closure in 1898. At the time of this survey, the canal was fully operational.